Around 300,000 of Germany's citizens with mental or physical disabilities of all races and religions were the first genocide victims. The Jewish Virtual Library reports: "The thick smoke from the incinerator was said to be visible every day over Hadamar (where, in midsummer 1941, the staff celebrated the cremation of their 10,000th patient with beer and wine served in the crematorium). A handful of church leaders, notably the Bishop of Münster, Clemens August Count von Galen, local judges, and parents of victims protested the killings. In response to such pressures, Hitler ordered a halt to Operation T-4 on August 24, 1941. Gas chambers from some of the 'euthanasia' killing centers were dismantled and shipped to extermination camps in occupied Poland. In late 1941 and 1942, they were rebuilt and used for the 'final solution to the Jewish question.'" America currently mass arrests its mentally dysfunctional citizens. The nation's budget for the prison industrial complex is over $100billion per year. If mentally ill people received treatment before tragedies, which is our "final solution," wealthy private jail and prison companies would experience a significant loss of human commodities used for prison profits. That is because timely treatment restores most people with bipolar disorder, schizophrenia, post traumatic stress disorder, and other mental illnesses back to wholesome living. It is not only more just and humane to treat mental illness like other chronic health conditions, but treatment before crises saves money as well as lives. We hope you want to help make that happen. ARE YOU AMONG THE "HANDFULL" of Christians, human rights advocates, and family members who are willing to unite against the current isolation, torture, and avoidable deaths of America's mentally ill people like certain people in Nazi Germany did despite fascism? 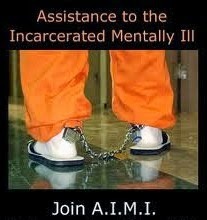 If so, you are invited to help us give Assistance to the Incarcerated Mentally Ill (AIMI). Please begin by supporting a mental health bill by Rep. Tim Murphy (PA-18) and Rep. Eddie Johnson (TX) - H.R.2646, the "Helping Families in Mental Health Crisis Act of 2015." It has provisions to replace incarceration with treatment for mentally ill people in America and provide crisis intervention team (CIT) training for police and corrections officers. Advocacy to end police violence against the mentally ill, end solitary confinement, decriminalize mental illness, remove barriers to timely psychiatric treatment, increase mental hospitals, reinstate insurance coverage for hospital inpatients, relax laws blocking involuntary commitment, establish assisted outpatient treatment (AOT) programs that mandate continued psychiatric care and medications and provide subsistence assistance (food and housing) for mentally ill people released from correctional facilities and hospitals, eliminate incarceration without trials, improve training for police and corrections officers, and end capital punishment, especially for mentally ill Americans. Guests include people who did or still do wrestle with mental illness in themselves or close relatives as well as people with specialized knowledge about mental illness, particularly in the criminal justice system. Contact Mary “Loves Justice” Neal to be a special guest at (678)531-0262 (cellphone) or (571)335-1741 (Google Voice). Also email me at AIMI@HumanRightsDemand.com and MaryLovesJustice@gmail.com >> Persistence is necessary, as our work is highly censored. 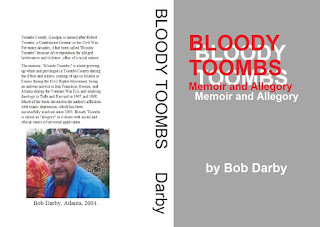 AIMI would like to introduce you to a brilliant writer and human rights advocate who has bipolar disorder: Bob Darby, author of "Bloody Toombs - Memoir and Allegory." Darby is a lifelong human rights advocate whose work centers on peace advocacy and helping the homeless mentally ill. He is founder of "Food Not Bombs" in Atlanta. Even while growing up as a privileged, white child from the Deep South, Darby was an anti-racism advocate who had a deep empathy for the downtrodden of society - a stance that caused a rift in his relationships with close family members and friends in the small Toombs County, Georgia town where Darby grew up. The former divinity school scholar from Emory, Harvard and Tufts Universities takes readers through his coming of age in the segregated South in the mid 1960's to the present, and we see glimpses of American history through Darby's eyes during a turbulent and exciting period when America was at war inside to "maintain the status quo" as well as in Vietnam, the last military conflict that used the draft. Darby's book also illustrates the changes in treatment options for mental illness through the years and challenges peculiar to persons with that condition. Purchasing a copy of "Bloody Toombs" will give you an excellent book on a par with "Having Our Say: The Delany Sister's First 100 Years" and "Forest Gump." Your purchase will also help give Assistance to the Incarcerated Mentally Ill. 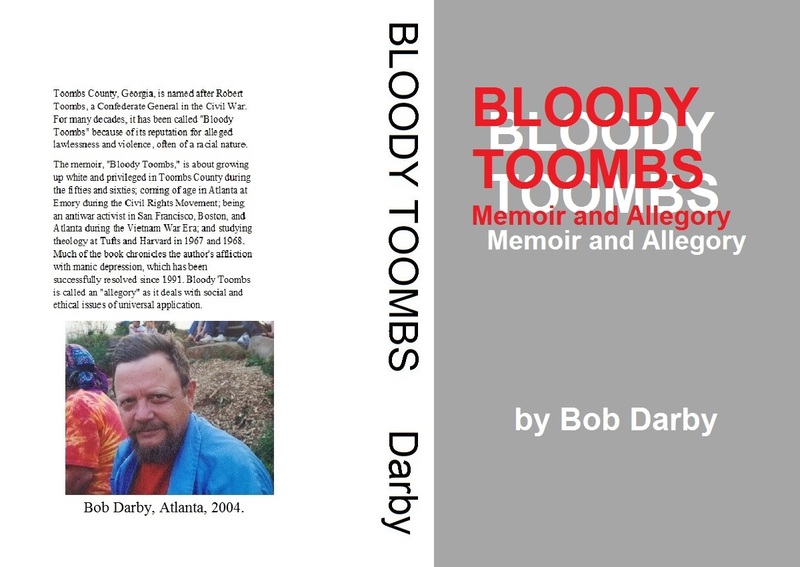 Please check at Amazon in mid-June 2015 to purchase a copy of "Bloody Toombs" or an ebook, and we hope you will give a review. 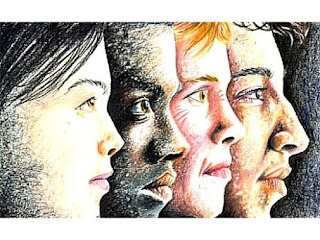 We encourage you to visit and join AIMI at Facebook, Google+ and Care2. AIMI has roughly 1,500 members and supporters and would welcome you and your friends who we hope you will invite by sharing this invitation. Large numbers of Americans demonstrating concern for improving mental health treatment would help prioritize fixing the nation's broken mental health care system. You help is sorely needed. The 1.25 million mentally ill prisoners in America comprise over half of the country's mass incarceration problem. Sixty percent of the inmates in solitary confinement are mentally challenged, and our most vulnerable citizens account for more than half of the nation's police violence victims in justified and unjustified use of force incidents. See a website among the eight references below that documents police-related deaths that appear in news reports, called "Killed by Police." Our officers need specialized training to handle lunacy arrests, and specialized training for corrections officers would help mentally ill inmates in custody. That is why AIMI advocates for CIT training. Please support AIMI's "final solution" - treatment B4 tragedy and CIT training. Merely join AIMI by "liking" the online groups below and/or using the "follow this blog" button in the right margin to "Dog Justice for Mentally Ill" blog to demonstrate your preference for treatment over the incarceration, prison torture, and wrongful deaths of mentally ill people. Joining AIMI shows you understand we need a system that does not await a crime before giving people with serious mental illnesses the psychiatric treatment they need and deserve. Some crimes have crime victims, but by standing together, we can improve community safety for ourselves and others. Read more about the Nazi's extermination of Germany's disabled people at the first of eight urls listed under "References" below, and please make a donation to the Jewish Virtual Library if you can. You might also enjoy reviewing/joining Treatment Advocacy Center and Mental Illness Policy Org (both have websites and Facebook pages, which you can reach by Google search). Links to the websites are provided under "References." We look forward to your demonstration that you care by sharing this article. You can do that by capturing the url at the top of the page and sharing it with your social media sites. Another way is to copy part or all of this article (highlight and hit ctrl "c") and paste it into your own blog or post it to your social sites and web pages (hit ctrl "v"). If you do copy and paste part or all of this article or any article(s) in the "Dog Justice for Mentally Ill" blog, always credit the source so that your friends and groups will have access to many other "Dog Justice" articles, which are listed in the index on the right margin of the blog. Mentally ill inmates as well as those who live under the treat of arrest, their families and I appreciate you for caring enough to share our article. "Helping Families in Mental Health Crisis Act 2015"
MENTAL ILLNESS CAN HAPPEN TO ANYBODY, AND EVERYBODY SHOULD CARE.